Time for an update! 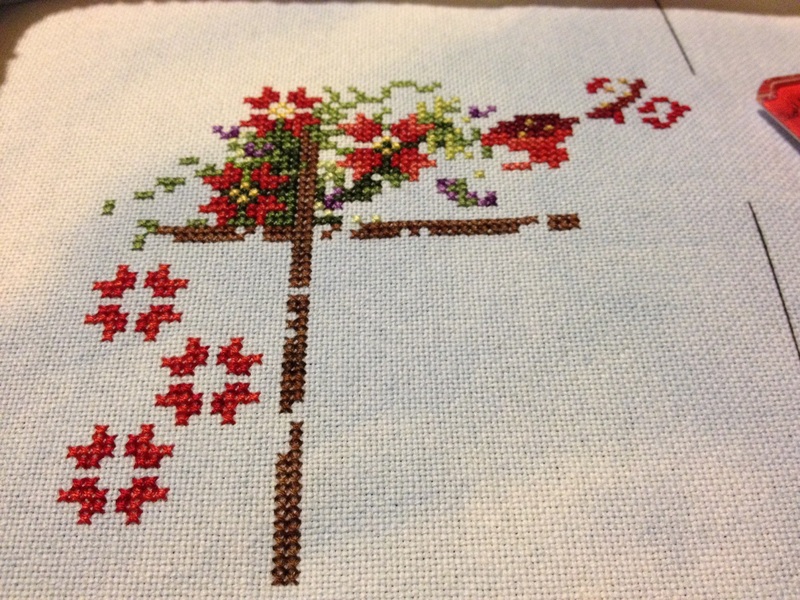 I set this cross stitch project down for May and most of June, but I’ve picked it up again over the past few weeks. Previous posts about Heart of Christmas can be found here and here. 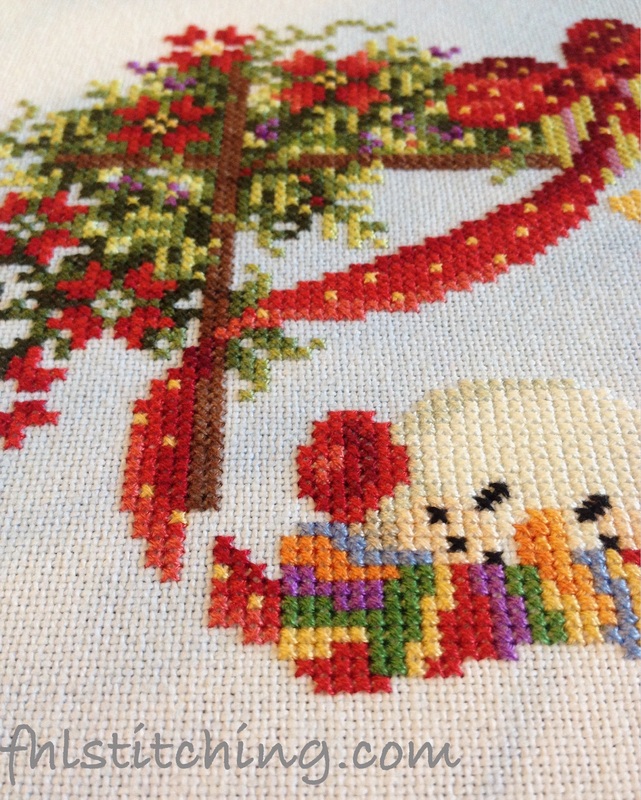 This is Heart of Christmas by Stoney Creek stitched over 2 on Stoney Creek Clear Sky Dyed Fabric 28 ct. 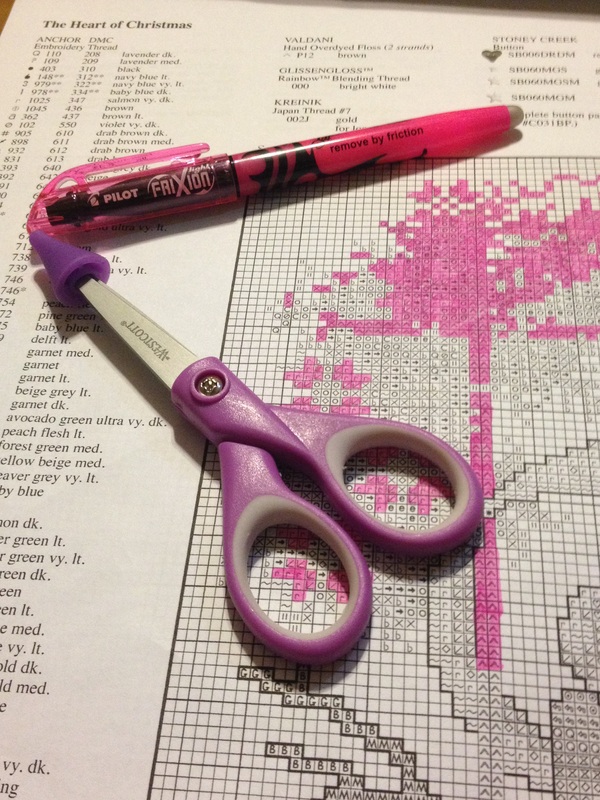 The main reason I started this blog was because none of my offline friends are into stitching. 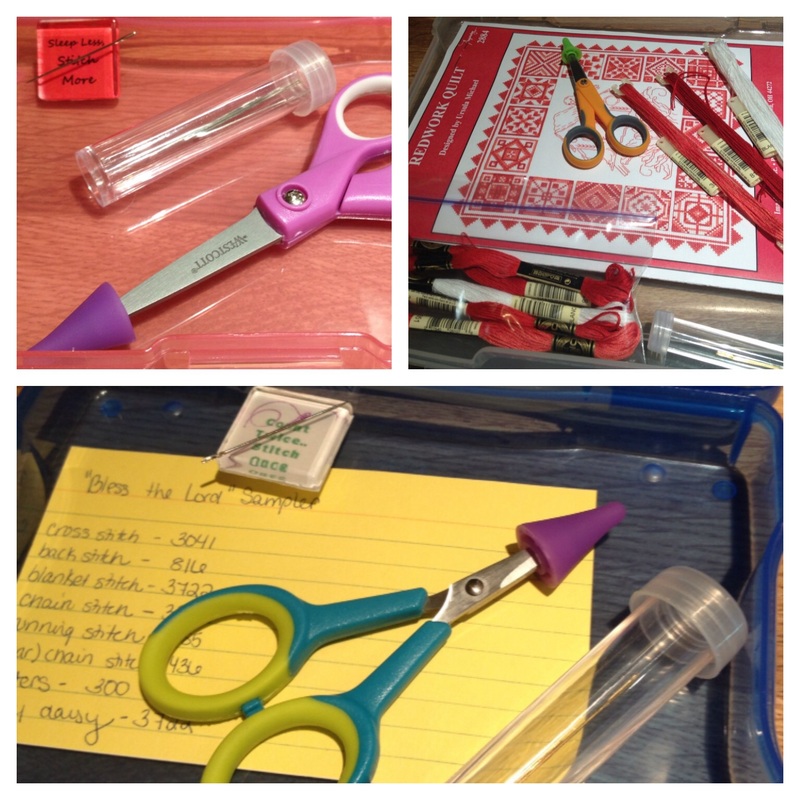 I wanted a place to share my work, admire others’, and learn and grow as a stitcher. In the short time I’ve been here, I’ve already seen so many interesting projects and techniques I want to try. One thing I’ve found intriguing as I look at others’ work is the variety of choices people make about the order in which they stitch. Some people work in blocks of a certain size (for example 10×10), others work in horizontal rows or vertical columns and still others work through their color chart one at a time. I’ve seen beautiful examples of all these techniques. Personally, I’m not so structured. 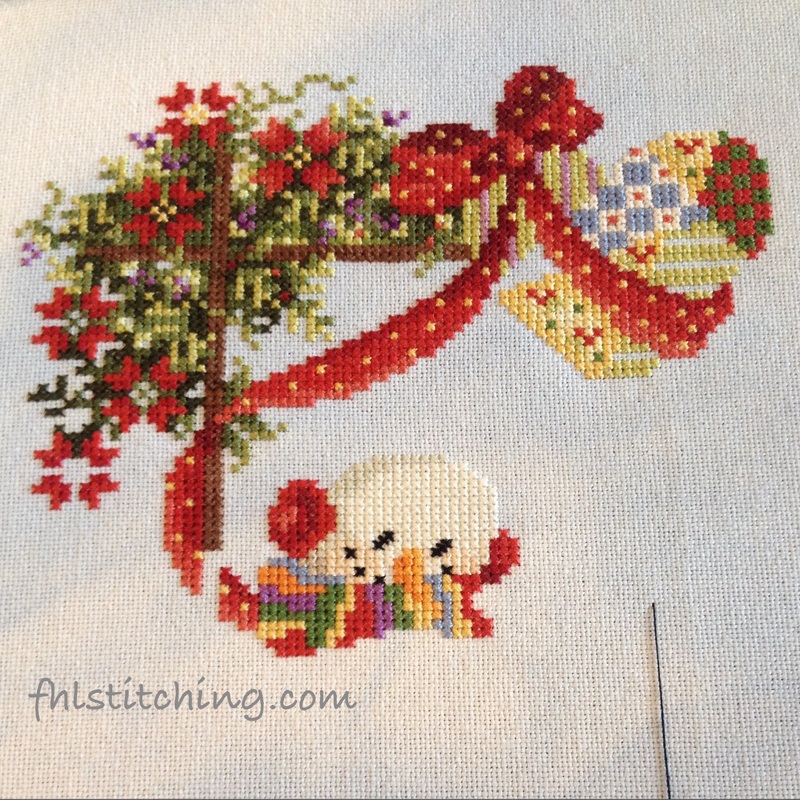 I love to hop around a bit as I stitch. For me, part of the fun is to look at the pattern and decide where I’ll go next. I love to strategize to try to keep the back of the work as neat as possible, and have the fewest spots where I hop the thread from one place to another. I don’t use knots at all, so I also have to strategize where I’ll start and stop each thread so it can be tucked under. And all of this while trying to waste as little thread as possible. For me, this is huge part of the fun. “Heart of Christmas” Can you see the snowman starting to emerge? Love his colorful scarf! Now off to tuck in the littles and pull out my project binder. Happy stitching! I have only used it a few weeks so far, so no telling how long the ink will last before it runs out. I’m curious though – does anyone have other tips for keeping your place in a pattern like this? 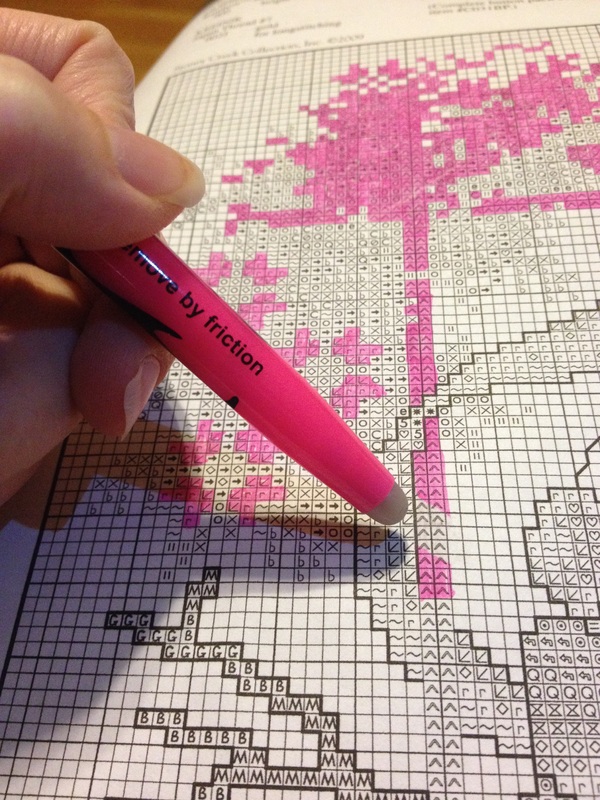 Marking a pattern with highlighter. 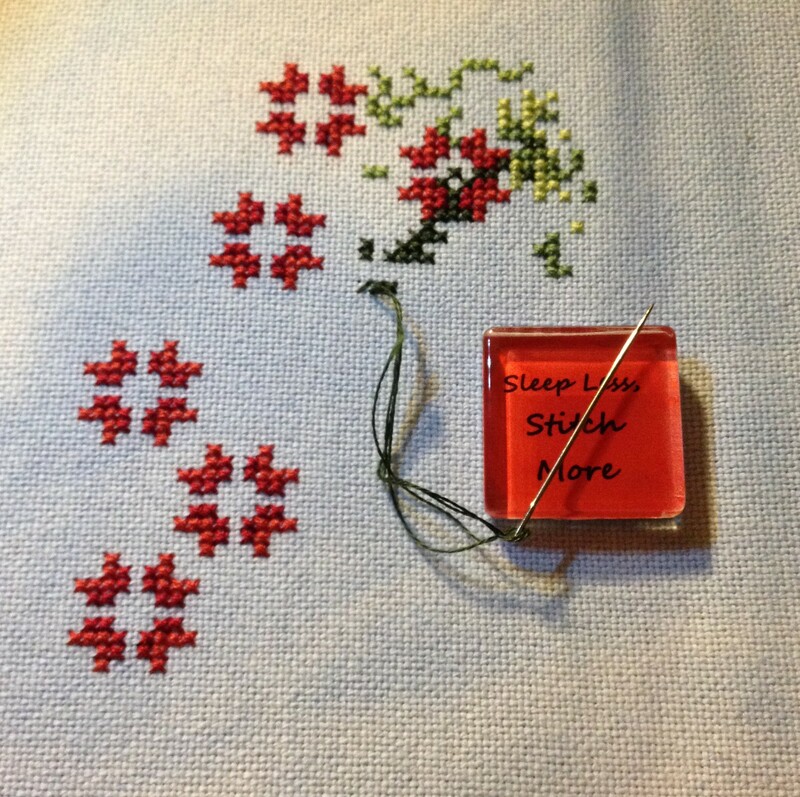 Last week I posted a new project start: Heart of Christmas by Stoney Creek. Here are a few progress pics. The section I’ve done so far is lots of confetti stitches of various colors (I’ll be glad to get into some nice blocks of color). But it’s coming together nicely. You can see the poinsettias with their surrounding greenery, and the teensiest bit of the red bow starting to emerge. First stitches. 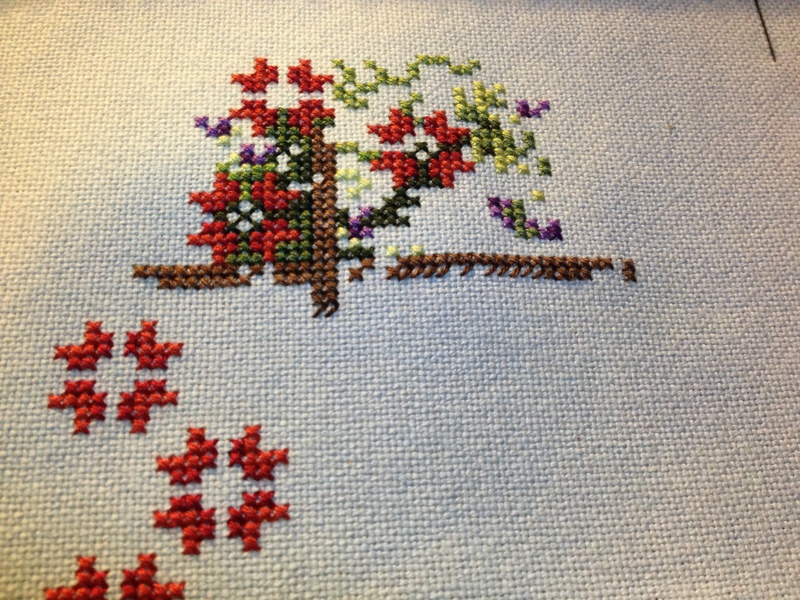 I stitched the poinsettias first to have an easy reference when I started the greenery. Flowers, greenery, trellis and a bit of a red bow in the upper right. 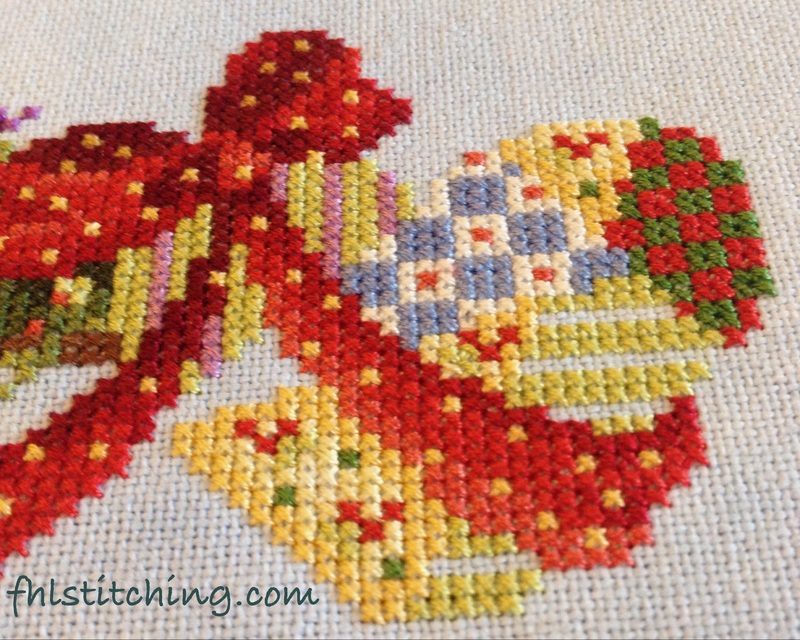 Last week I posted about my finish of Faith Hope Love by Joyful Expressions. This left an open spot in my rotation. Joy of joys!! Just think of the possibilities!! After seeing so many lovely WIPs on stitching blogs I follow, I decided I wanted to tackle a slightly bigger or more complex project. The others I have going right now are fairly simple and with just a few colors. For quite some time I’ve had my eye on “Heart of Christmas” by Stoney Creek. I know we’re coming into spring and I have no idea why I am so drawn to a Christmas pattern except it has so many beautiful bright colors! 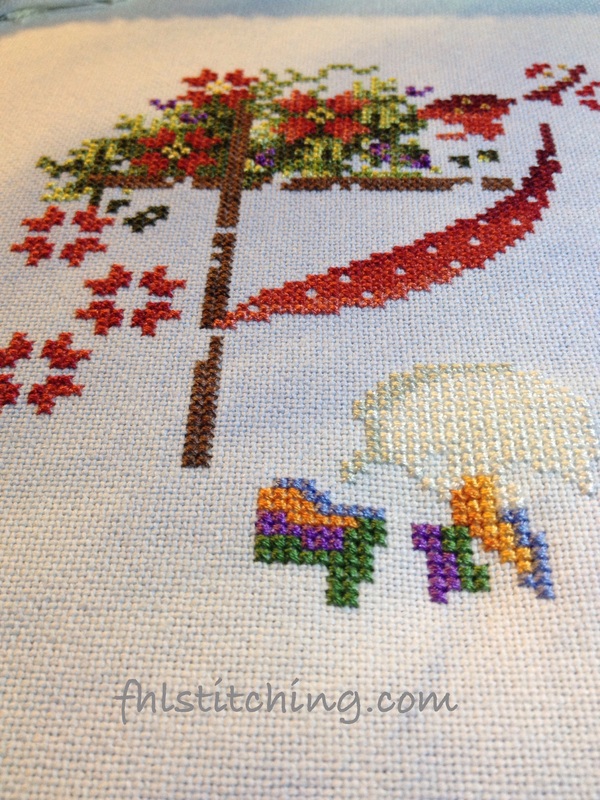 You know how I love to stitch bright colors. Sadly, I don’t have a local needlwork shop within an hour of me, so I do a lot of ordering online. 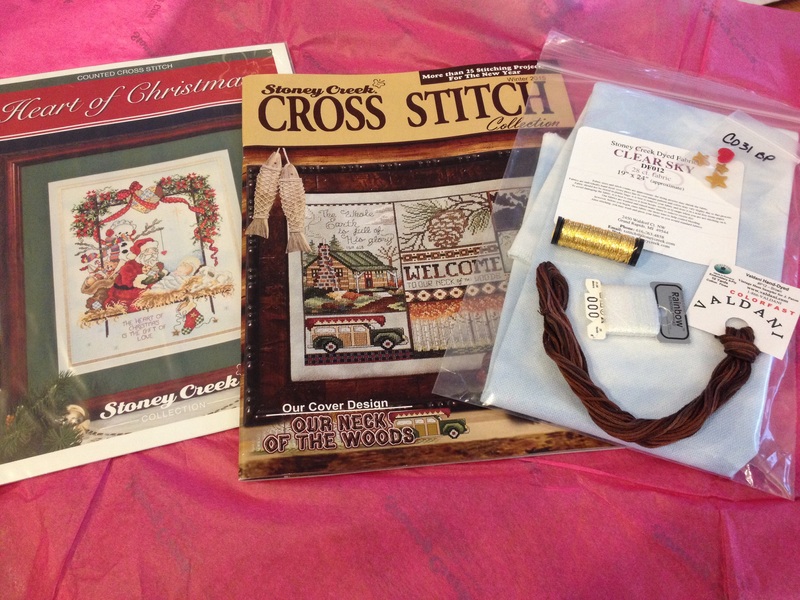 In this case, once I got on the Stoney Creek website, I had to order a few specialty threads and buttons to go with the pattern… and I just couldn’t resist the winter edition of their magazine… and a subscription. Sigh. So here’s the deliciously lovely pile of stuff that arrived a few days later. I adore the ‘clear sky’ dyed fabric as a backdrop for the pattern, don’t you? My package from Stoney Creek!